A small Hydrangea Macrophylla begins its life in the garden in a pot, surrounded by Oxalis. Planting in the ground is a huge amount of work. Not only do you need to dig a hole or dig a whole bed, the soil usually needs to be amended with compost, pea gravel, and fertilizer. Once the plant is in the ground, its roots are vulnerable to voles and insects. As the plant grows, it gets more complicated to move if you decide it needs to be placed somewhere else. 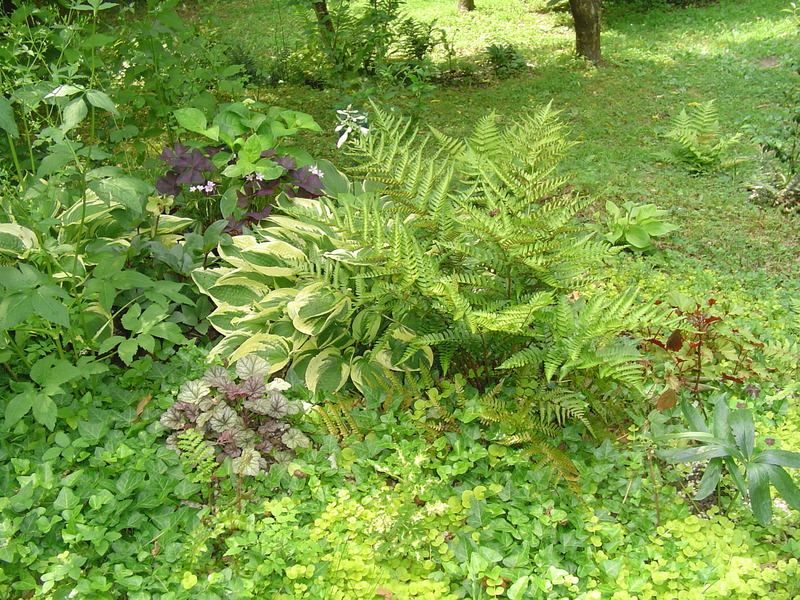 Small shrubs and trees are more vulnerable to grazing than as larger plant, but the large plants cost many times what a small one does, and are much harder to bring home from the garden center. A small “Josee” re-blooming lilac anchors this group of geraniums, Angelonia, and succulents. I prefer to plant in pots, at least when my plants are very young. Not only are the pots beautiful, they allow you to group interesting combinations of plants together. You can grow in sunny areas that are already paved, and you can grow shrubs to a larger size before moving them out into the soil of your garden. 1. Use the largest pots you can afford, and that fit your space. Large pots hold their moisture longer than small pots, and offer more room for roots to develop. They are taller and make more of a statement. A few large pots look more harmonious than many small pots, and take less effort to maintain. When grouping a number of pots together, try to use pots that are similar in material and color, or create a deliberate contrast. A motley collection can distract from the beauty of the plants. 2. Make sure your pot has drainage holes, but line your pot so the soil doesn’t run out. Scraps of landscaping fabric work well as a permanent liner. Even a paper towel will hold the soil until the roots fill out the pot. Top dress a finished pot with small gravel, larger stones, and sea shells. Not only is this pretty, it protects the roots of the plant from digging squirrels, drying sun, and pounding rain. The plants stay cleaner and healthier. A “Four Season” potted garden of Edgeworthia, Autumn Fern, Ajuga, and bulbs. 4. The current fashion is to pack every last square inch of space with a plant so the finished pot looks full from the day you plant it. Good gardeners are patient. Keep in mind the mature size of a plant, and how much room its roots will need. Once the roots grow, the pot can be so jam packed that its hard to keep the soil sufficiently moist for good growth. Only plant the number of plants a pot can sustain when the plants mature. An exception to this is when a tree or shrub is involved, since you’ll be changing the pot up as it grows. 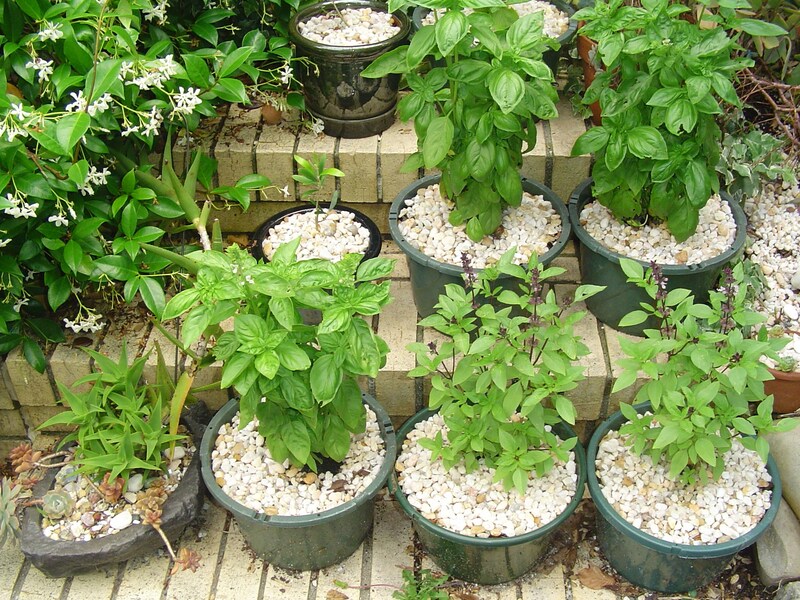 A cutting garden of Basil thrives on the steps in full sun. The small trees are olive trees, purchased through the mail. They will be allowed to grow in these small pots for several years. Treat your plants with respect, and allow each room to reach its potential. The pot will look a little sparse to begin with if you begin with small transplants, but in a few weeks the plants will fill and weave together beautifully. 5. If planting several plants in the same pot, begin with a dominant plant to serve as backdrop for the rest. This might be a small shrub, a perennial, a vegetable, or a fern. After choosing one dominant plant, select companions to fill in around it which share its needs for light and water. Keep in mind the color and shapes of both the foliage and the flowers of the plants you select to compose beautiful groupings. This “Josee” re-blooming lilac came mail order several years ago, and spent the first few seasons growing in pots. 6. Plan your potted planting to last for several months, if not several years. (A Four Season Pot step by step) Anchor the pot with a perennial, fern, or shrub, and then fill out the arrangement with bulbs, herbs, perennials, and annuals. Keep in mind that as the annuals fade or go out of season they can be replaced, keeping the pot fresh and attractive indefinitely. If you have a bright space inside to over winter certain pots, go ahead and use tropical plants such as Caladium, Alocasia, Begonia, Philodendrons, and tender ferns in your compositions. Caladiums will eventually die back, and then return the next summer if kept warm. Sometimes they even send out leaves during the winter after they have rested for a few months. 7. 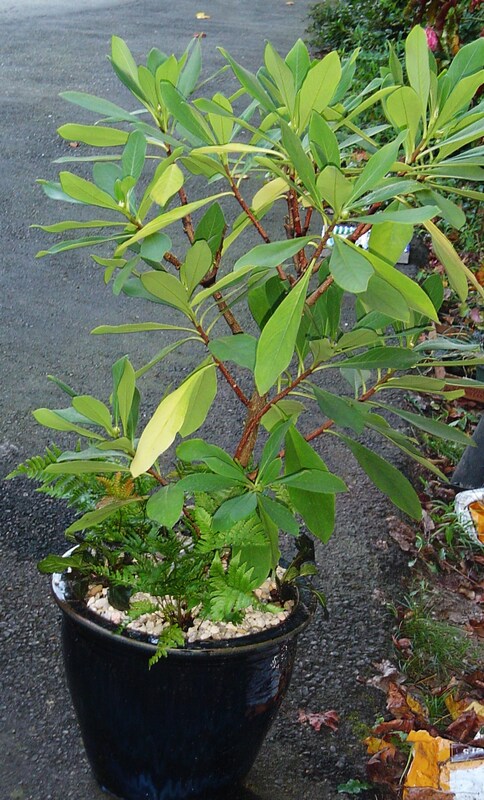 In late autumn, purchase shrubs at a discount to provide winter interest in your pot. Whether an evergreen or a deciduous shrub, this will lend structure and height to your planting. 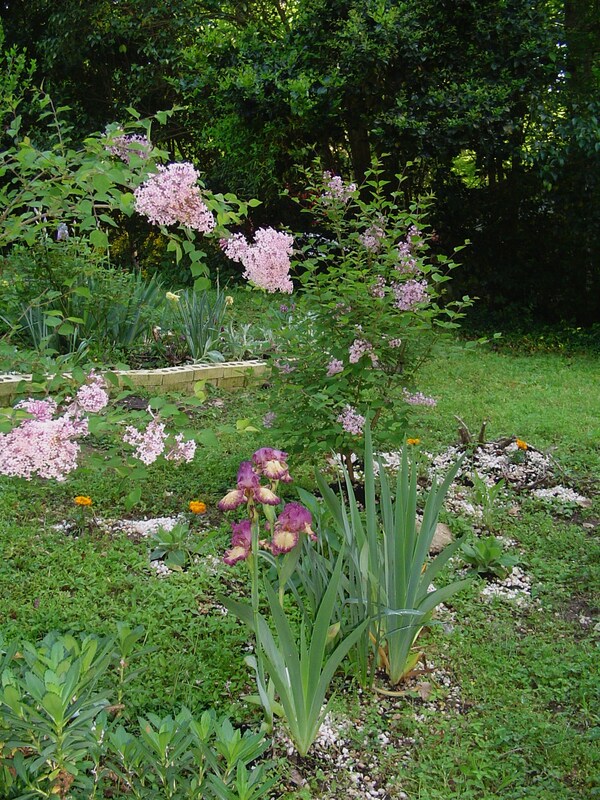 Add bulbs for spring color at the appropriate depth when planting the shrub. Daffodil or tulip bulbs can be placed around the root ball. Snowdrops or Scillia can be poked in once the pot is full of soil. Finish off with some violas for constant color from September through May. 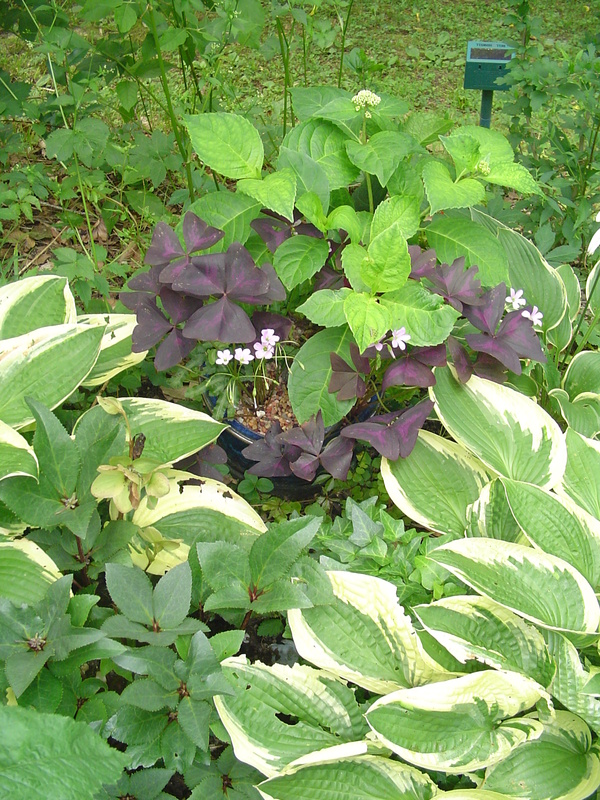 A trailing vine like Vinca, Creeping Jenny, or an ivy can be tucked in between the violas. 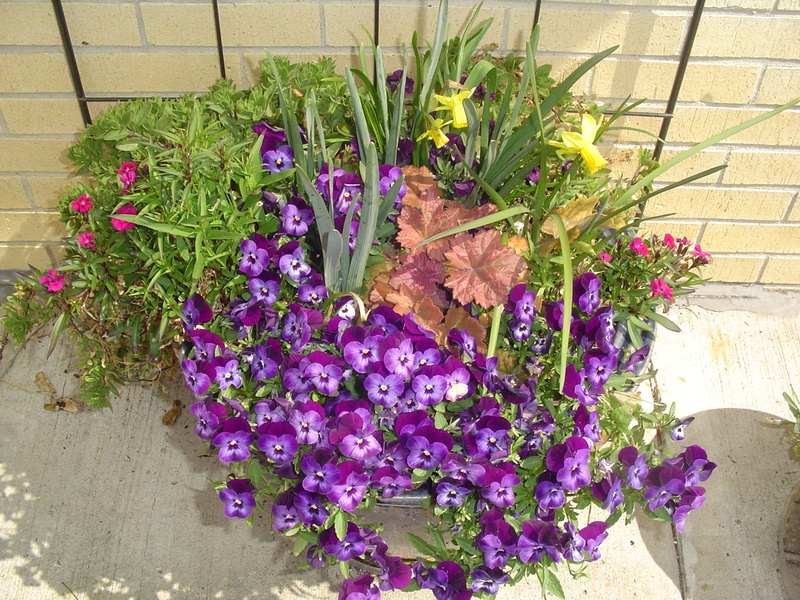 Violas, Dianthus, Heuchera, and Daffodils fill this pot to overflowing in March. Petunias overwintered in the pot also and came back into bloom a few weeks after this photo was taken. When the Violas are fried in the heat of early summer, switch them out for an appropriate summer annual and top dress the pot with soil as needed, and fresh Osmocote, for another season of beauty. 8. 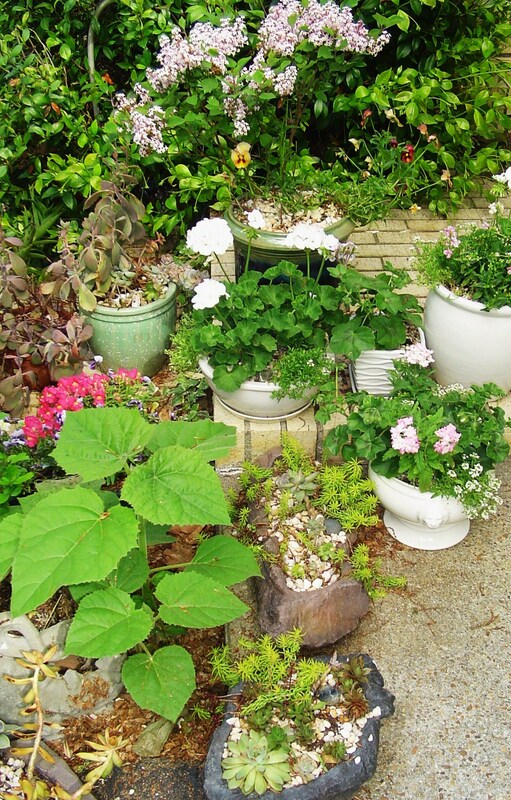 When it is time to redo pots for the new season, recycle the plants you remove. Plant out ferns and violas into the garden where they will get the shade they need for the hot months ahead. Plant bulbs, foliage still attached, into the ground if you don’t want to leave them in the pot for the next season. When trees and shrubs outgrow their pot, you can trim the roots and repot, move them up to a larger pot, or plant them out to a spot in your garden. The Autumn Brilliance fern, Creeping Jenny, ivy, and the Heuchera all spent a season or two as parts of potted gardens, and then eventually were moved out into a flower bed. 9. Grow plants deer find delicious in pots in a protected are, out of reach. This may be the only way to grow tomatoes, eggplant, cucumbers, and strawberries when you live in a forested neighborhood. Grow tasty annual flowers in large hanging baskets out of reach of deer, rabbits, and voles. Hang them in trees if they enjoy shade, or from hooks in sunny areas. 10. Shrubs ordered from catalogs or online can be great bargains, especially when ordered during sales and promotions. They are carefully packaged, and usually arrive growing in small pots or bare root. These small plants can be used in pots for their first year or two, and then moved out to their permanent spot when they are larger and stronger. This allows you to enjoy the shrub up close on a deck or patio for a year or so before it becomes a part of the landscape. This also allows you to try out combinations of companion plants on a small scale before investing in plants to cover a large bed or border.